The brass sparrow is 3 1/2" which has been carefully altered to fit the curve of any wrist. 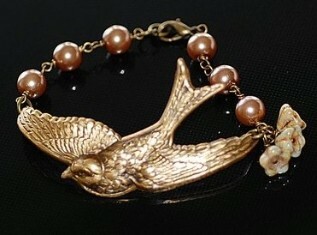 The sparrow is accented with vintage glass taupe pearls and 3 Czech glass bell-flowers. This bracelet measures approximately 7 1/2" and closes with an antique brass lobster clasp. 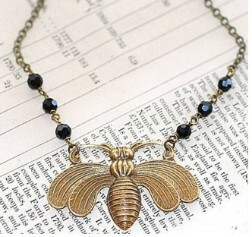 Vintage Style 1 3/8" x 2" antiqued brass bee pendant. Suspended from antiqued 18" chain with vintage faceted onyx beads. A great necklace to add just the right amount of interest and colour to any outfit! 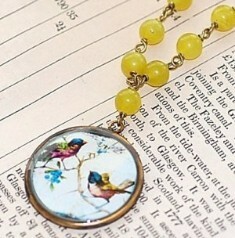 The cameo is set in an antiqued brass setting, on an 18" chain detailed with 6mm lemon jade.